Solar power is pretty awesome, and it can save you a lot of money and reduce the consumption of dirty fuels (for electricity). We want you to be informed, so we’ve compiled a great deal of solar-related information and resources that should help you become a smart, savvy consumer. We’re also here to help you go solar, in the event that you want to get a few free quotes from local solar installers. Using the widget on the right you can get a real-time solar cost estimate in minutes, as well as quotes from multiple solar installers. 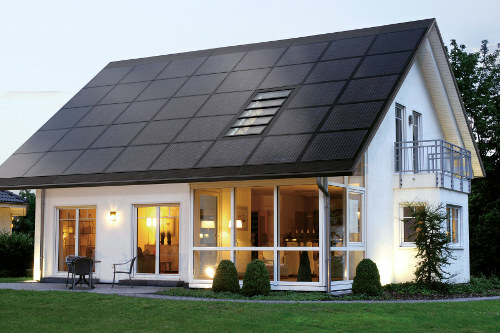 If you’re just here to learn, read on or navigate to our Get Started Solar Guide. Our Solar Blog is here to help. Because buying solar energy for your home IS complex. Buyer beware. There is no standard pricing for solar panels, and solar installation companies have little incentive to offer you the best price. The online researcher must be extremely cautious when searching for general information, since the search engines have reached a saturation point with solar companies, individuals, and middlemen trying to sell you solar. There are numerous good solar companies out there, as well as services that are trying to make it easier for homeowners to go solar. Do your homework, then get a solar quote. It’s important to understand the basics of solar, so do some general reading if this is new to you. But if you own a home and want to buy solar panels, the next step is more difficult: how do I find an installer, and what is it going to cost? You can calculate the cost of solar on your own, but in the end it makes sense to have the pros do the work. Our favorite is still One Block Off the Grid, the solar group discount company – they can answer all your questions, hook you up with local installers, and give you online estimates on cost, plus discounted pricing through group discounts. You can sign up or get a solar estimate here. #1. The earth receives about 1,366 watts of direct solar radiation per square meter. That’s an incredible amount of energy. 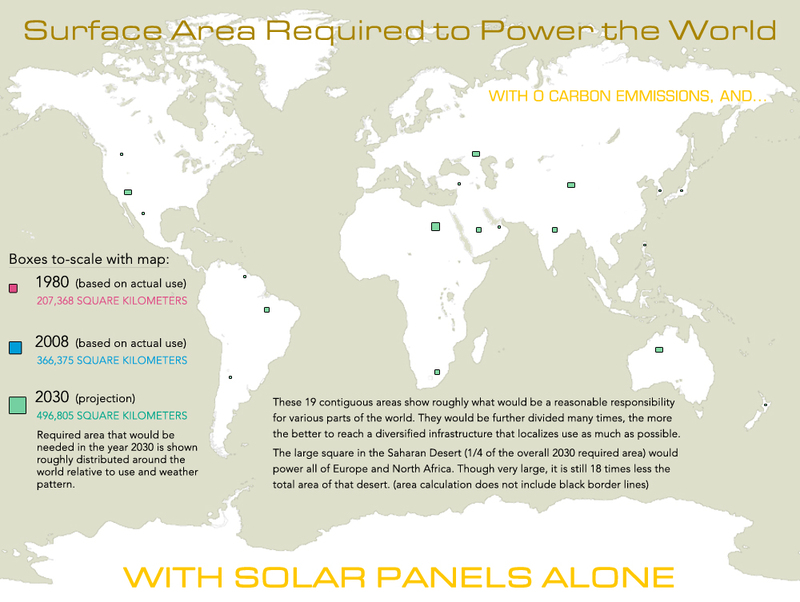 In fact, it has been estimated that the total surface area required to power the world with solar energy is only around 366,375 square kilometers. That may seem like a lot unless you visualize the area like this. Homes with solar energy in the United States hover at somewhere under 1% of the total. That’s an incredibly low market penetration when compared to something like air conditioning (50-60% of homes). While there are obvious practical barriers affecting residential solar installation rates, the solar energy industry is expected to grow 20-40% per year for the next 10 years. Most people are unaware of this, but some experts assert that global civilization is firmly planted in the golden years of the coal era. Without taking into account the embedded costs of coal mining, distribution, and burning for energy, coal-powered electricity is cheap. This will not always be the case. U.S. electricity prices increase at a rate of 6% per year and future policies, like carbon tax credits or solar renewable energy credits, could change the game very quickly. Even without these changes, solar energy has already reached what is called grid parity (it’s as cheap as coal-based electricity) in some areas (like Hawaii), and this area is expected to expand rapidly by 2012. A major solar energy industry report from 2009 indicated that there are four primary barriers to solar adoption: cost, complexity, misinformation, and inertia. It’s important to consider that solar panels are the only home improvement that pay for themselves, and depending on local factors (especially electricity rates and state rebates) full payback can occur very quickly. Every state in the US offers the Federal solar tax credit and has a unique blend of state, and local utility incentives, subsidies, and rebates available to homeowners interested in solar power. In some areas, as much as 90% of the cost of a home solar array can be offset by rebates and solar energy credits. All of this will be covered in more detail on Solar Energy Facts. In addition to this there are many emerging companies aimed at helping consumers navigate the solar buying marketplace.